Environmentalists will readily admit it's not easy being green, unless you're Kermit's sister, who has no idea if Robin's father is the Honey Smacks guy or any of the three Budweiser frogs. Helping you bag Kermit's sister green cred while you drink: the20. Just now available in Oregon from a couple guys with chops in environmental biz and small wineries, the20 home-delivers wine to be stored 'n poured from their resto-tested, blowing-away-boxes, in-home cask storage system that increases vino's shelf-life while being environmentally friendly and cheaper through less packaging, which is weird, because a reduced package generally leads to you spending waaay more. 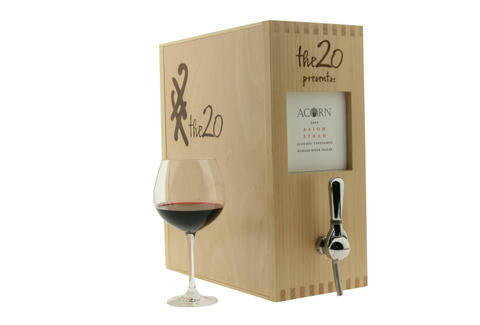 The heart of 20 is the Franzia-pwning, bar-enhancing cuboid cask that ditches wasteful cardboard for long-lasting red oak (just like wine barrels); gravity feeds wine into your sippy cup via a European stainless steel tap, which connects to disposable inserts holding four bottles worth of juice preserved in airtight, tri-laminate "eco-bags", also the most hilarious thing ever to call really old hippie chicks. To get drankin', you just gotta buy one cask, then get wine bags delivered either on a per-order basis, or via a monthly wine club, all of it from tasting panel-vetted indie vintners producing under 5,000 cases a year; perhaps most awesomely, if you're not digging your selection, you can return it for a full refund, so hopefully your lame excuse that you were seeing if the almost-empty eco-bag "would grow on you" will grow on them. While the20 is currently only repping Cali labels, their mobile bagging unit allows them to travel and package at wineries they'd like to represent, which they hope will eventually bring them to the Willamette Valley -- although no matter where it's from, if Kermit's sister drinks it and you even resemble a frog, the wine will lead to some box.